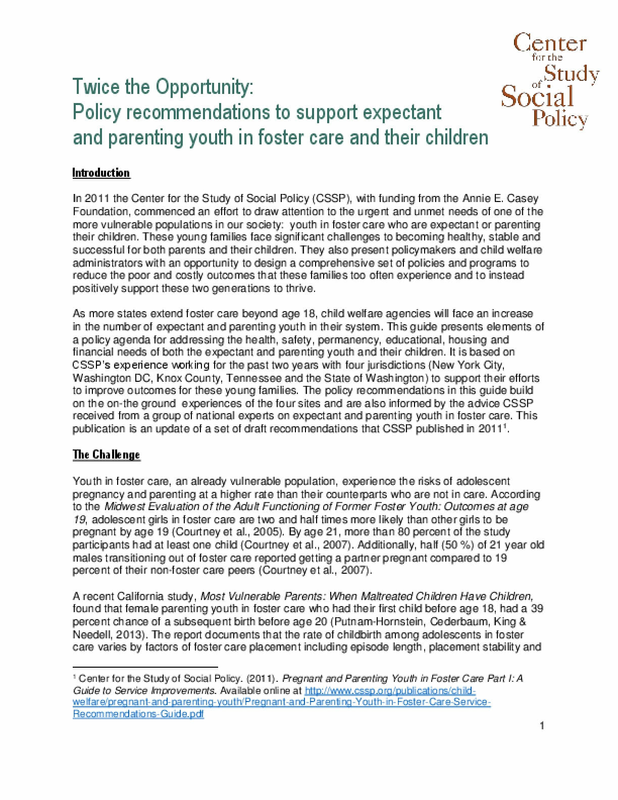 In 2011 the Center for the Study of Social Policy (CSSP), with funding from the Annie E. Casey Foundation, commenced an effort to draw attention to the urgent and unmet needs of one of the more vulnerable populations in our society: youth in foster care who are expectant or parenting their children. These young families face significant challenges to becoming healthy, stable and successful for both parents and their children. They also present policymakers and child welfare administrators with an opportunity to design a comprehensive set of policies and programs to reduce the poor and costly outcomes that these families too often experience and to instead positively support these two generations to thrive. As more states extend foster care beyond age 18, child welfare agencies will face an increase in the number of expectant and parenting youth in their system. This guide presents elements of a policy agenda for addressing the health, safety, permanency, educational, housing and financial needs of both the expectant and parenting youth and their children. It is based on CSSP's experience working for the past two years with four jurisdictions (New York City, Washington DC, Knox County, Tennessee and the State of Washington) to support their efforts to improve outcomes for these young families. The policy recommendations in this guide build on the on-the ground experiences of the four sites and are also informed by the advice CSSP received from a group of national experts on expectant and parenting youth in foster care. This publication is an update of a set of draft recommendations that CSSP published in 2011. Copyright 2014 by Center for the Study of Social Policy (CSSP). All rights reserved.